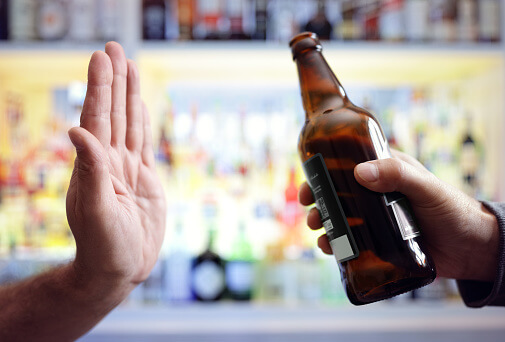 “Alcohol is the most commonly used addictive substance in the United States: 17.6 million people, or one in every 12 adults, suffer from alcohol abuse or dependence along with several million more who engage in risky, binge drinking patterns that could lead to alcohol problems,” according to the National Council on Alcohol and Drug Dependence (NCADD). Drinking too much alcohol negatively impacts your health in many ways. For example, alcohol is a depressant that can change your brain chemistry and make you feel depressed, anxious and stressed. You likely already know that excessive consumption of alcohol may cause liver damage, and you have probably seen research about an alcohol and cancer link. Drinking too much may even cause you to lose your hair! But what might not be on your radar is alcohol’s effect on your blood cells. First, let’s get a better understanding about your blood to put this all in context. Your blood is important to your health, because it circulates through your body and delivers oxygen and essential nutrients. Blood also carries carbon dioxide and waste materials away from your body’s tissues. Red blood cells (RBCs), carry oxygen from the lungs to the rest of the body. Also called erythrocytes, RBCs are the most common type of cell found in the blood. Platelets, help with blood clotting. Also called thrombocytes. Without platelets, you would bleed to death from an open, bleeding wound. Blood cells are made in the bone marrow, the spongy material in the center of the bones. Heavy drinking over long periods may lead to poisoning of the bone marrow. And if your bone marrow is poisoned, you may have some serious problems with your blood cells (the indirect consequences). “Alcohol’s indirect effects include nutritional deficiencies that impair the production and function of various blood cells,” according to one report from the NIH. These nutritional deficiencies can result in anemia due to a decrease in the number of red blood cells produced by the body as well as impaired RBC function and metabolism. Red blood cells may even be destroyed and removed from the bloodstream before their normal lifespan is over. In severe cases of alcoholism, a person may need a blood transfusion because the RBCs die too quickly. Symptoms caused by improperly functioning red blood cells include fatigue, shortness of breath, lightheadedness, reduced mental capacity and abnormal heartbeats. Alcohol depletes nutrients from the body. Alcohol affects the way your body absorbs nutrients. Alcoholics tend to have poor diets. Individuals who abuse alcohol are often deficient in nutrients, like zinc, iron, folate and other B vitamins, which play a major role in the efficiency, development and ongoing production of red blood cells. Drinking too much may cause the body to have problems with absorbing folate from food. And the rest of those critical components of your blood, like the white blood cells (WBCs) and platelets, are also negatively impacted by too much alcohol. Too much alcohol may reduce the number of WBCs. This may cause anemia and make you less capable of fighting off infections. “In addition to its well-known association with lung infection (i.e., pneumonia), alcohol abuse now is recognized as an independent factor that increases by three-to-four-fold the incidence of the acute respiratory distress syndrome, a severe form of acute lung injury with a mortality rate of 40 to 50 percent,” reports the NIH. And finally, alcohol abuse may severely reduce the number of platelets you have. This may contribute to anemia and also cause dangerous amounts of bleeding, since platelets help your blood clot. “When you get a cut, for example, the platelets bind to the site of the damaged vessel, thereby causing a blood clot. There’s an evolutionary reason why they’re there. It’s to stop us from bleeding,” said Dr. Marlene Williams of John Hopkins Medicine. With a loss of platelets, an ordinary nosebleed could lead to bleeding in the brain. In some cases, just two to four months of abstinence from alcohol can get your red blood cells functioning back to normal. Monocyte (a type of white blood cell) function may return to normal just after one week of not drinking alcohol. Platelet production may also improve after just one week of abstaining. This does not mean that you can binge drink and then take a break and binge drink again. As a general rule of thumb, men should not regularly drink more than 3 to 4 units of alcohol per day, while women should not regularly drink more than 2 to 3 units. If you are concerned that you do drink too much and may have issues with you blood, there are several blood tests you can take to help determine where you stand. For example, the Mean Cell Volume test will help the doctor see if your red blood cells are abnormally large. And a nutritional test can identify existing nutritional deficiencies. And as with most things regarding our health, good nutrition is key. If you want to increase your red cell blood count, you may be able to do this by having an adequate intake of iron, folate, vitamin B12, copper and vitamin A.
Vitamins C and E as well as the mineral zinc may also help with white blood cell production and immune function. You can get the majority of your nutrients from eating a diet very rich in nutrient dense fruits and vegetables. If you suffer from alcohol addiction or know someone that does, just remember the negative health consequences and identify those resources you can use to help kick this debilitating addiction.